We have reached the halfway point of the Kansas high school football season, and district play has started for most classifications. Let’s find out how our voters have adjusted the top five in each classification as we begin district play. Top-ranked Derby defeated Class 5A power Bishop Carroll for a third consecutive season. The Panthers led 10-6 at halftime and tacked on an offensive and special teams touchdown in the second half. Just like last year’s game with Carroll, Derby quarterback Grant Adler left the game with an injury and did not return. Hunter Igo stepped in and led the Panthers to the win. Second-ranked Lawrence Free State struggled through a first half that ended with the Firebirds tied with winless Shawnee Mission West. Free State had multiple touchdowns called back due to penalty. In the second half, the Firebirds cleaned things up and rolled to a 35-7 victory. Manhattan moves up two spots to No. 3 in this week’s poll. 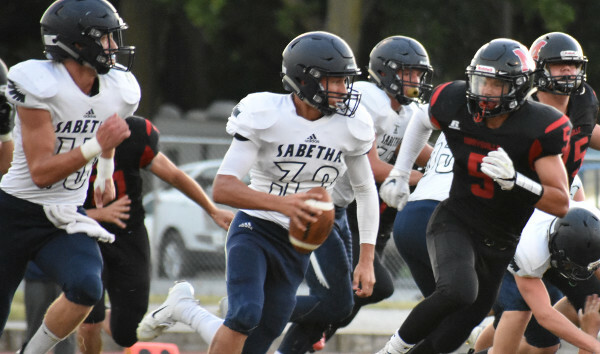 The Indians traveled to Topeka and blasted Washburn Rural, 44-7, in a game featuring the two remaining unbeaten teams in the Centennial League. Manhattan rushed for 450 yards in the win. Olathe North stays in the No. 4 this week despite a 48-12 loss at Columbine (Colo.). The Rebels are ranked No. 3 in Colorado’s Class 5A, the largest classification in that state. Finally, Topeka High enters the rankings at No. 5 this week. The Trojans scored five touchdowns in the second half to win at Junction City, 56-28. Topeka’s lone loss of the season came 21-20 in overtime to Manhattan on a controversial finish that appeared to show Trojan back Ky Thomas diving into the end zone for what would have been the winning two-point conversion. Blue Valley drops out of the poll this week after a 42-7 loss to Missouri-power Rockhurst. Wichita Northwest survived another shootout to move to 4-0. A week after beating Great Bend 56-34, the top-ranked Grizzlies outscored Wichita West 56-32 on Thursday night. While the Grizzly offense has been scoring at will, things may prove more difficult this week against Kapaun Mount Carmel defense that has statistically been one of the state’s best all season. St. Thomas Aquinas got two long second-half touchdown runs from sophomore Tank Young to defeat No. 5 Mill Valley, 24-13. After the Jaguars kicked two field goals in the fourth quarter to pull within 17-13, Young broke a 70-yard touchdown run to put the Saints up 11 points. Despite the loss, Mill Valley remains in the poll at No. 5 this week. Maize climbs up a spot for the second consecutive week to No. 3. The Eagles recorded its fourth consecutive shutout with a 45-0 decision against Newton. Maize and Scott City are the only two teams in the state that have yet to allow a point. Maize will travel to Class 4A No. 5 Goddard this week. Bishop Carroll falls just one spot their loss to Class 6A No. 1 Derby. The Golden Eagles will have a challenging road trip this week at Great Bend (3-1). Bishop Miege delivered a 45-0 shutout of St. James Academy for their 29th consecutive victory. The Stags now have a showdown with Rockhurst this week. The Hawklets, a traditional power in Missouri and throughout the Midwest, are ranked in the top 5 in Missouri Class 6. McPherson remains ranked second quickly rolling past Abilene. Jace Kinnamon scored five touchdowns as the Bullpups scored 35 points in the first quarter in rolling past the Cowboys, 62-6. McPherson travels to Buhler this week. Third-ranked Pittsburg survived an upset scare from rival Fort Scott by converting on a 30-yard field goal by Cade Bressler in the final 80 seconds. The Dragons then batted down a Tiger fourth-down pass in the end zone to preserve the 17-14 win. Paola moves up a spot this week to No. 4 after a 35-0 win over Spring Hill. The Panthers and Broncos were scoreless until well into the third quarter when Paola exploded for five scores. Goddard drops one spot to No. 5 this week. After trailing rival Goddard-Eisenhower 3-2 for much of the game, the Lions scored a touchdown and field goal in the fourth quarter to win 12-3. Goddard has one of the state’s top defenses, but will get a test this week when Maize comes to town. The Eagles feature standout quarterback Caleb Grill, and a defense that hasn’t allowed a point all season. Andale rolled to a third consecutive shut out by blanking Haven, 65-0. The Indians have scored 127 points in the past two weeks without allowing anything. Andale will be heavily favored again this week when they take on winless Wichita Trinity. Sabetha remains in the No. 2 spot after beating Marysville, 36-12, in a rematch of last year’s Class 3A state title game. Last year, the Bluejays intercepted a Marysville pass at the goal line to preserve a 7-6 victory and claim the state title. Sabetha will continue district play this week with a trip to Hiawatha. Along with Maize, Scott City is the other team in the state that has not allowed a point this season. The Beavers rolled to a 47-0 shutout of Ulysses and allowed only 112 yards of total offense – the most the Beavers have allowed in a game all season. Pratt stays in the No. 4 spot after a 55-0 shutout of Larned. The Greenbacks will travel to Kingman this week. Last season, Kingman defeated Pratt 39-25 in district play – keeping the Greenbacks (then ranked No. 3) from qualifying for the playoffs. Perry-Lecompton rebounded from its two-point loss to Sabetha with a 52-18 victory over Wellsville. The Kaws will travel to Santa Fe Trail in a key district game this week. Top-ranked Phillipsburg rolled to a 56-20 victory over rival Norton. Panther quarterback Trey Sides threw four touchdown passes – three to his younger brother Ty Sides. Phillipsburg will host Thomas More Prep this week. Conway Springs remains at No. 2 after a hard-fought 22-8 victory over Hutchinson Trinity. The Celtics scored first before Conway Springs took control behind two Peyton Winter touchdowns. Conway Springs forced Hutchinson Trinity into four turnovers. Third-ranked Silver Lake, fourth-ranked Chaparral, and No. 5 Garden Plain each rolled to dominating victories to open district play. Silver Lake and Chaparral will be heavily favored again this week, while Garden Plain gets a test against the aforementioned Hutchinson Trinity Celtics. Class 1A is definitely where the most movement occurred in this week’s top five. Smith Center, however, stays in the top spot after rallying for two fourth-quarter touchdowns to beat then No. 5 Plainville, 21-10. Smith Center grinded out a 22-play, 80-yard drive to take a 14-10 lead, then broke a long touchdown on the next possession to go up two scores. Olpe moves up to No. 2 this week after a 20-18 win at previously-unbeaten and unscored upon Jackson Heights. The Eagles delivered coach Chris Schmidt’s 100th career win. Schmidt has posted a 100-35 record in his 12th season leading the Eagles. Elkhart rolled to a 54-0 victory at Clayton, New Mexico. Quarterback Lane Whisennand led the Wildcats with 265 yards rushing and three touchdowns. Elkhart will travel to traditional Hi-Plains League rival Meade this week. After starting the year ranked No. 2, Centralia jumps back into the top five after a 20-0 shout of No. 5 St. Mary’s Colgan. Centralia got more than 200 yards rushing from Isaac Gore and held the visiting Panthers to 68 yards of total offense. Colgan uncharacteristically struggled with penalties and turnovers. The Panthers dropped to No. 5 in this week’s poll, but will try to rebound with a game against Abilene this week. Hoxie found itself in a 14-0 hole to Leoti-Wichita County on Friday night. The Indians then tied the game at 14 by halftime and pulled ahead for a 36-20 win the in the second half. Hoxie will put it streak of 12 straight games on the line again this week as the Indians travel to unbeaten St. Francis. Sainty is the last team to beat Hoxie, 16-8, Week 5 of the 2017 regular season. Central Plains made a statement by rolling past district challenger Little River, 46-0. The Redskins had rolled to an unbeaten start while averaging 48 points per game, but despite a significant size advantage, couldn’t move the ball against the Oilers. Hodgeman County blasted previously-unbeaten Kiowa County, 62-12. Longhorn sophomore quarterback Isaac Salmans accounted for four total touchdowns in the win. Hodgeman County will be favored the next two weeks before challenging district games against Spearville and Ness City to close out the regular season. Clifton-Clyde and Solomon switch spots this week despite both teams picking up impressive victories. Clifton-Clyde rolled to a 64-14 win at Hill City. The Eagles scored on every first-half possession in building a 50-14 lead at the break. Solomon went on the road to capture a 60-14 win over Goessel. The Gorillas rushed for nearly 400 yards in the win. Solomon travels to Bennington this week. Hanover picked up another victory this week despite not getting to see the field. The Wildcats received a forfeit victory from Blue Valley Randolph. This is the second game the Rams have forfeited this season, and since this is a district game, this should disqualify Blue Valley Randolph from post season play. Osborne remains in the No. 2 spot after a 60-14 victory over Sylvan-Lucas Unified. The Bulldogs host Logan-Palco (2-2) this week. South Barber rolled to a 54-8 victory at South Haven. The Chieftains got four rushing touchdowns from senior back Neal Gugelmeyer. Fourth-ranked Otis-Bison delivered a third consecutive shutout with a 46-0 blanking of Satanta. The Cougars are well in control of District 8, but will travel to Minneola this week before a non-district showdown with No. 3 South Barber. Axtell rolled to a 54-6 win over Pike Valley behind a big game from quarterback Quinn Buessing. Buessing passed for 219 yards and six touchdowns in the win.